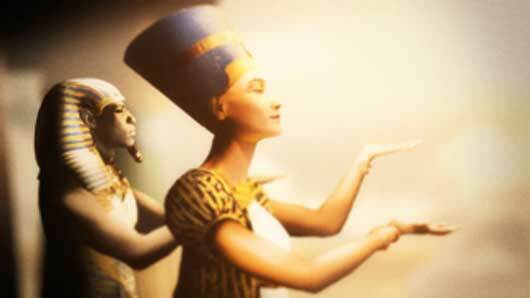 Nefertiti and her husband Akhenaten worship the sun god, Aten. 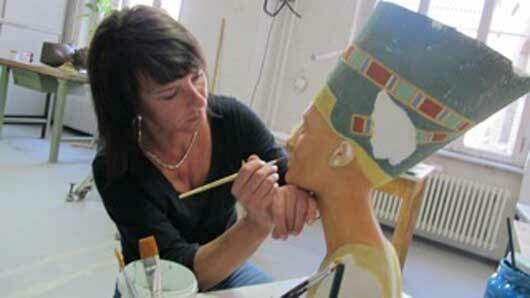 An artist in the Museum’s workshop paints a reproduction of the bust of Nefertiti. 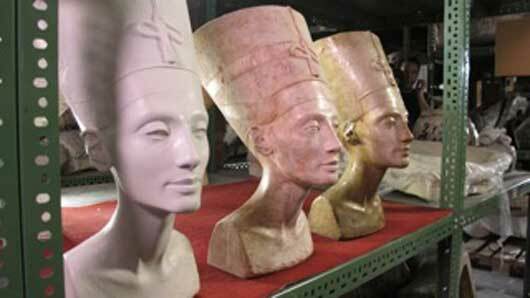 Several reproductions of the bust of Nefertiti have been perfected over the years. The beautiful and mysterious bust of Queen Nefertiti, an object so popular and alluring that she has her own room in the Neues Museum. The beautiful and mysterious bust of Queen Nefertiti. 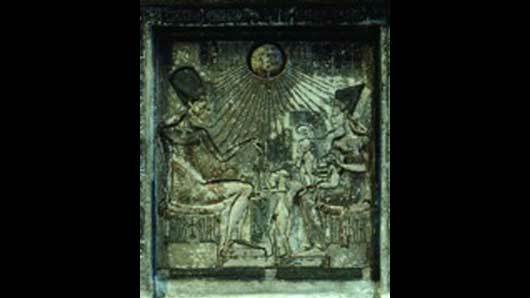 Akhenaten and Nefertiti offer libation to the sun god, Aten [The Art Archive / Egyptian Museum Cairo / Collection Dagli Orti]. Pharaoh Akhenaten and Nefertiti adoring the sun [The Art Archive / Egyptian Museum Cairo / Collection Dagli Orti]. Why are so many people so fascinated by her likeness? 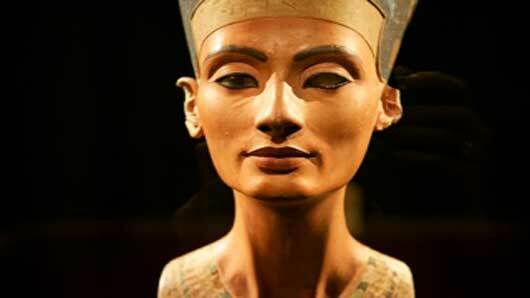 And was the real Nefertiti fascinating too? Inside the Neues Museum, one gallery always draws the biggest crowds. The gallery displays only one artifact. But one is enough when it’s the bust of Nefertiti. This 3000-year-old likeness of an Egyptian Queen is a box office superstar. Thousands come to the museum to visit her every day. 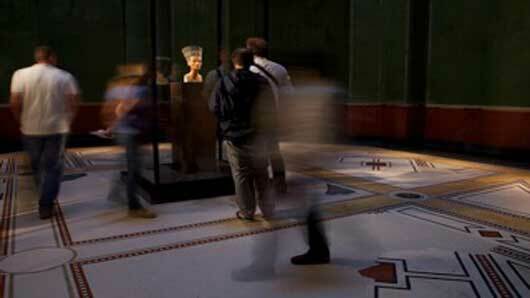 In the broadcast episode we focused on some museum visitors as they view Nefertiti for the first time. Some seemed only mildly interested. Perhaps Nefertiti was simply on their bucket list. But some appeared to be trying to peer through the glass into Nefertiti’s soul. Why is she the object of such intense fascination? To find out we visit a workshop where artists recreate the bust for sale in the museum’s gift shop. They strive to capture her beauty, and her telling imperfections. Can they explain why she is fascinating? Or is the explanation part of the story of her life as a Queen of the Nile? All is revealed in Museum Secrets: Inside the Berlin Islands Museums. Nefertiti reigned by the side of her husband Pharaoh Akhenaten. Shortly after he took power, he introduced Eygpt to a religion called Atenism. 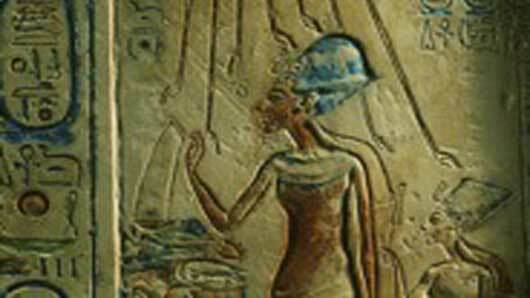 In contrast to Egypt’s traditional polytheistic faith, the new religion made one god – Aten – supreme. Some historians have suggested that Atenism was a monotheistic religion linked to Judaism. But Atenism might have been a different type of religious faith known as Henotheism. To find out what Henotheism is and who practices it we invite you to start at this Wikipedia page.